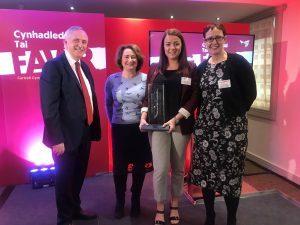 As one of the nine social landlords partnered together to deliver the Free from Fear project, we’re extremely proud that the project recently won the Pat Chown Capturing Creativity award, presented by Community Housing Cymru. The project is unique in its creative approach to tackling domestic abuse and won the award for its work on the development of a web portal for housing staff to use when responding to reports, incidents and disclosures of domestic abuse. Originally established to offer a more effective service for social housing tenants in Gwent suffering from domestic abuse, Free from Fear funded the research and development of a paper-based toolkit which was later developed into a web portal at www.freefromfear.wales in 2017. With funding from the Welsh Government’s Violence against Women, Domestic Abuse and Sexual Violence (VAWDASV) programme, the website provides housing staff with an online resource accessible on smartphones, tablets and laptops. 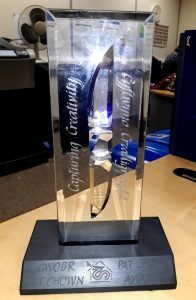 The Capturing Creativity Award was set up eighteen years ago by Community Housing Cymru in memory of Pat Chown, a significant figure in the Wales housing sector who was committed to finding new ways of working. The award recognises innovation and new ideas to deal with common problems. As well as the award, the Free from Fear project received a £1000 donation for their chosen charity Welsh Women’s Aid. The Free from Fear project partnership is made up of Bron Afon Community Housing, Pobl Group, Caerphilly County Borough Council, Melin Homes, Monmouthshire Housing, Newport City Homes, United Welsh Housing Association, Dderwen Cymru and Tai Calon Community Housing.